The policy of Irish neutrality during World War II was adopted by the Oireachtas at the instigation of the Taoiseach Éamon de Valera upon the outbreak of World War II in Europe. It was maintained throughout the conflict, in spite of several German air raids by aircraft that missed their intended British targets and attacks on Ireland's shipping fleet by Allies and Axis alike. De Valera refrained from joining either the Allies or Axis powers. While the possibilities of not only a German but also a British invasion were discussed in the Dáil, and either eventuality was prepared for, with the most detailed preparations being done in tandem with the Allies under Plan W, De Valera's ruling party, Fianna Fáil, supported his neutral policy for the duration of the war. This period is known in the Republic of Ireland as "the Emergency", owing to the wording of the constitutional article employed to suspend normal government of the country. Pursuing a policy of neutrality required attaining a balance between the strict observance of non-alignment and the taking of practical steps to repel or discourage an invasion from either of the two concerned parties. Despite the official position of neutrality, there were many unpublicised contraventions of this, such as permitting the use of the Donegal Corridor to Allied military aircraft, and extensive co-operation between Allied and Irish intelligence, including exchanges of information, such as detailed weather reports of the Atlantic Ocean. For example, the decision to go ahead with the Normandy landings was decided by a weather report from Blacksod Bay, County Mayo. 4 Ireland, Britain's last Redoubt? Ireland was in 1939 nominally a Dominion of the British Empire and a member of the Commonwealth. The nation had gained de facto independence from Britain after the Anglo-Irish War, and the Anglo-Irish Treaty of 1921 declared Ireland to be a 'sovereign, independent, democratic state'. A new constitution was adopted by a plebiscite in 1937. The Statute of Westminster meant that unlike in World War I, Britain's entry into the war no longer automatically included its dominions. Relations between Ireland and Britain had been strained for many years; until 1938 the two states had engaged in the Anglo-Irish Trade War. Nevertheless, Ireland did not sever its vestigial connection with the Crown and it was not until the Republic of Ireland Act 1948 that the final nominal link was severed. No representatives of the new state attended Commonwealth conferences or participated in its affairs, but Ireland remained a legal member until the British Ireland Act 1949, which accepted the declaration of a Republic and formally terminated its membership in the Commonwealth. Alongside George VI's few remaining powers, the 1937 Constitution had provided that the holder of the new office of President of Ireland was in "supreme command of the Defence Forces". Irish neutrality was supported by the population of Ireland, although a minority favoured fighting against the Axis powers. Irish citizens could serve in the British armed forces, as at least 50,000 in the British Army did, as well as in the Merchant Navy and Royal Air Force, with some rising up the ranks rapidly, such as the youngest wing commander fighter ace in the RAF's history: Brendan Finucane. 4,983 members of the Defence Forces deserted to fight with the British and Allied armed forces. After the war, they faced discrimination, lost their rights to pensions and were barred from holding government jobs. They were finally formally pardoned by the Irish Government in 2013. Travel passes and identity cards were also issued to 245,000 people to enable them to travel to Britain to work. Elements of the Irish Republican movement sided with the Third Reich at the onset of the war with the United Kingdom in 1939, believing that a German victory might bring about a United Ireland. With such sweeping executive powers, de Valera's cabinet set out to tackle any problems that might arise and curb any inconsistencies with the nation's policy of neutrality. Censorship of radio newscasts meant newsreaders were confined to reading, without comment, the dispatches of each side, while weather forecasts were halted to preclude the inadvertent assistance of planes or ships involved in the war. Public expressions of opinion appearing to favour one side or the other were usually repressed. The word "war" itself was avoided, with the Government referring to the situation in Europe from 1939 to 1945 as "the Emergency". Social and economic conditions in Ireland at this time were harsh. Wages stagnated but prices rose. There were serious shortages of fuel and some foodstuffs. Many people[who?] balked against the moral diktats of church and state in the economic realm. Meanwhile, cross-border smuggling and the black market underwent something of a boom. President Douglas Hyde was of the Church of Ireland, most of whose members were ex-unionists and pro-British. When he was invited to a 1943 wedding to be attended by many of the former Protestant Ascendancy, his secretary received assurances from the bride that there would be no "pro-belligerent demonstration either by toasting the King of England and/or the singing of the British National Anthem". The Irish government had good reason to be concerned lest the war in Europe re-open the wounds of the Civil War. There were pro- and anti-fascist movements in Ireland, and the IRA continued to pursue its own agenda. Former Old IRA commander and founder of the Fine Gael Party General Eoin O'Duffy became a leader of the fascist Blueshirt organisation in 1932–33. In recognition of his consistent support for Ireland's Jews, Éamon de Valera, Ireland's Taoiseach during the war, has a forest in Israel named in his honour. In this context, it is relevant to note that two Irish contingents fought in the 1937 Spanish Civil War – but on opposing sides. O'Duffy's Irish Brigade fought with the (Fascist) Nationalists and the Irish contingent of the International Brigades fought with the Republicans, though neither had government support. In the six months prior to the onset of war, there had been an escalation of Irish Republican Army violence and a bombing campaign in Britain under the new leadership of Seán Russell. De Valera, who had tolerated the IRA as recently as 1936, responded with the Offences against the State Act, 1939. Upon the outbreak of the main conflict in September, subversive activity was regarded as endangering the security of the state. There were fears that the United Kingdom, eager to secure Irish ports for their air and naval forces, might use the attacks as a pretext for an invasion of Ireland and a forcible seizure of the assets in question. Furthermore, the possibility that the IRA (in line with the Irish republican tradition of courting allies in Europe) might link up with German agents, thereby compromising Irish non-involvement, was considered. This threat was real: Russell, in May 1940, travelled to Berlin in an effort to obtain arms and support for the IRA. He received training in German ordnance, but died on a submarine while returning to Ireland as part of Operation Dove. A small number of inadequately prepared German agents were sent to Ireland, but those who did arrive were quickly picked up by the Directorate of Military Intelligence (G2). Active republicans were interned at the Curragh or given prison sentences; six men were hanged under newly legislated acts of treason and three more died on hunger strike. The Germans also later came to realise they had overestimated the abilities of the IRA. By 1943, the IRA had all but ceased to exist. In Ireland, neutrality was popular, despite rationing and economic pressure. No country had ever been more effectively blockaded because of the activities of belligerents and our lack of ships, most of which had been sunk, which virtually cut all links with our normal sources of supply. The diminutive Irish Mercantile Marine continued essential overseas trading. This period was referred to as "The Long Watch" by Irish mariners. They sailed unarmed and usually alone, flying the Irish tricolour. They identified themselves as neutrals with bright lights and by painting the tricolour and EIRE in large letters on their sides and decks, yet twenty percent of seamen perished in a war in which they were non-participants. Allied convoys often could not stop to pick up survivors. Irish ships always answered SOS calls; they always stopped to rescue. Irish mariners rescued seafarers from both sides, but they were attacked by both, predominantly by the Axis powers. Vital imports arrived. Exports, mainly food supplies for Great Britain, were delivered. 521 lives were saved. Many British ships were repaired in Irish shipyards. Despite being frequently encountered as rumours, no U-boats ever used Ireland as a refuelling base. The origins of this claim likely originates with the 1939 dumping of 28 rescued Greek sailors by German submarine U-35 onto the Irish coast, after the U-boat commander Werner Lott sank their Greek cargo freighter, which was bound for Britain with metal ore. This U-boat incident was featured on the cover of the popular U.S. Life magazine, on 16 October 1939. As in the days preceding, news of the dumping was widely published, the magazine and the locals who spotted the unloading of the captured Greeks noted that the U-boat had conducted the action and re-submerged before coastal defense aircraft could be directed onto the trespassing vessel. At a series of meetings in 17–26 June 1940, during and after the Battle of France, British envoy Malcolm MacDonald brought a proposal to end the partition of Ireland and offered a solemn undertaking to accept "the principle of a United Ireland" if the independent Irish state would abandon its neutrality and immediately join the war against Germany and Italy. However, the reality of unity would have to be agreed by the "representatives of the government of Éire and the government of Northern Ireland", each of which distrusted the other intensely. De Valera therefore rejected the amended proposals on 4 July, worried that there was "no guarantee that in the end we would have a united Ireland" and that it "would commit us definitely to an immediate abandonment of our neutrality". De Valera had campaigned against partition and the 1937 Constitution drafted by him had an irredentist clause describing the State as the "whole island of Ireland". After the war he again called repeatedly for the ending of partition. The offer and his rejection remained secret until a biography was published in 1970. In April 1941, the question of Ireland's entry into the war was again raised when the Australian Prime Minister Menzies paid a visit to Belfast and Dublin for private discussions with De Valera and John M. Andrews, the Prime Minister of Northern Ireland. Subsequently, Menzies reported to Churchill that the complexity of the questions of Irish unity and sovereignty meant that there was little possibility of Ireland's abandoning its policy of neutrality. Without the Irish treaty ports (which the United Kingdom had released a year prior to the war), an independent Ireland posed a serious disadvantage to the military capability and safety of British fighting and trade, risking the possibility of invasion if that disadvantage ever proved too great. If Irish sovereignty was to be maintained, then neutrality would have to be steered consciously to the benefit of British interests, as these were its own: at once to aid the British war effort but also to forestall invasion by Britain to regain the treaty ports. Ireland, like other neutrals was '...neutral for the power that potentially threatened them most.' During the war, and accusing de Valera as a 'Nazi sympathiser', the Prime Minister of Northern Ireland, Lord Craigavon, urged Churchill to use Scottish and Welsh troops to overrun 'southern Ireland' before installing a Governor-General for the whole island at Dublin, but this proposal was rejected by London. Nevertheless, Churchill directed Field Marshal Sir Bernard Montgomery to prepare plans to seize Cork and Queenstown (Cobh) so their harbours could be used as naval bases. Better submarine-detecting technology, as well as military bases in Iceland, meant that the Irish ports were no longer as vital for the Allies as they had been during World War I. In this regard Viscount Cranborne acknowledged at the war's end that the Irish Government had '…been willing to accord us any facilities which would not be regarded as overtly prejudicing their attitude to neutrality', collaborating with the British war cabinet. (See below for complete text.) The pattern of co-operation between British and Irish agencies began upon the onset of war when de Valera permitted the use of specified Irish airspace mainly for patrolling coastal points. The use of the "Donegal Corridor", the narrow strip of Irish territory between County Fermanagh and the sea, was significant. By the autumn of 1941 use of the corridor was a daily routine. While de Valera rejected British appeals to use Irish ports and harbour facilities directly, de Valera was, according to M.E. Collins, 'more friendly than strict neutrality should have allowed.' The co-operation that emerged allowed for meetings to take place to consider events after German troops had overrun neutral Denmark, Norway, the Netherlands and Belgium. Three days after the fall of France, Irish and British defence officials met to discuss how British troops could, strictly at de Valera's invitation, occupy Ireland upon the event of a German landing there to expel foreign troops attempting to use her as a back door to later invade Britain (Plan "W"). The meetings continued, as Cranborne described, throughout the war, facilitating further dialogue. Other examples of Irish attitudes towards Nazi Germany found expression in mid-1940 in de Valera's Chargé d'Affaires in Berlin, William Warnock, 'whose "unquestionable" hostility to Britain could easily be interpreted as sympathetic for National Socialism.' Academic J.J. Lee questioned just how much of Warnock's zeal towards Hitler's Reichstag speech on 19 July was genuine enthusiasm for the 'international justice' that could be expected after Germany's victory, as opposed to an adherence to the instructions of Dublin to please oneself to the potential victors. Three years later, by 1944, the orientation of the war and of Irish relations to Germany had turned about-face, with the likelihood of a German victory now remote. In that climate the Irish Government, once so ready to 'say agreeable things', Hempel remarked, had become 'unhelpful and evasive'. The United States Ambassador to Ireland, David Gray, stated that he once asked de Valera what he would do if German paratroopers "liberated Derry". According to Gray, de Valera was silent for a time and then replied "I don't know". Ireland maintained a public stance of neutrality to the end by refusing to close the German and Japanese Legations, and the Taoiseach Éamon de Valera signed the book of condolence on Adolf Hitler's death on 2 May 1945, and personally visited Ambassador Hempel, following the usual protocol on the death of a Head of State of a state with a legation in Ireland. President Hyde visited Hempel separately on 3 May. The visits caused a storm of protest in the United States. Irish envoys in other nations did likewise, but no other Western European democracies followed Ireland's example. Ireland's position on Jewish refugees fleeing Europe was sceptical. Irish authorities during the war generally gave two justifications for turning away prospective immigrants: that they would overcrowd the nation and take Irish jobs, and that the presence of a large Jewish population would inflame anti-Semitic sentiments amongst the Irish. There was some domestic anti-Jewish sentiment during World War II, most notably expressed in a notorious speech to the Dáil in 1943, when newly elected independent TD Oliver J. Flanagan advocated "routing the Jews out of the country". Although overt anti-Semitism was not typical, the southern Irish were indifferent to the Nazi persecution of the Jews and those fleeing the [T]hird Reich….A successful applicant in 1938 was typically wealthy, middle-aged or elderly, single from Austria, Roman Catholic and desiring to retire in peace to Ireland and not engage in employment. Only a few Viennese bankers and industrialists met the strict criterion of being Catholic, although possibly of Jewish descent, capable of supporting themselves comfortably without involvement in the economic life of the country. In his book Wings over Ireland – History of the Irish Air Corps, Donal McCarron gives extensive details on the otherwise secret Rathduff aerodrome. He states that as early as the summer of 1940 both governments were worried about the "Doomsday scenario" of a successful invasion of Britain. The RAF would need at least one aerodrome to continue the fight in Ireland and both the Irish and British armies secretly scouted for a site in the south of Ireland. The other airfields of Rineanna near Limerick and Dublin Airport and Baldonnel near Dublin would cover other parts of Ireland, so the RAF was keen on a site near the southeast coast. The Irish Army disagreed, fearing a German invasion would overrun it quickly, so both finally agreed on a site in the south of County Tipperary, in the valley of the river Suir, east of the Galtee Mountains. This also suited the Irish army as they had built a secret command headquarters near a convent school seven miles away to be used in case of invasion. The name "Rathduff" was chosen as a cover because such a name is to be found all over Munster. Both sites were completely out of bounds for all normal military operations. With Hitler turning towards the USSR in 1941 the chances of an invasion of Britain waned and the Irish Army decided to hold a major exercise to test the planning and training it had been undertaking for four years, in autumn 1942. As part of this, "Rathduff's" secret was partially released, with it serving as the airfield for Ireland's 2nd Division during the exercise. After the exercises "Rathduff" slipped into obscurity, its fields returning to use as the thoroughbred stud farm they had been before. “ I would like to put a hypothetical question-it is a question I have put to many Englishmen since the last war. Suppose Germany had won the war, had invaded and occupied England, and that after a long lapse of time and many bitter struggles, she was finally brought to acquiesce in admitting England's right to freedom, and let England go, but not the whole of England, all but, let us say, the six southern counties. These six southern counties, those, let us suppose, commanding the entrance to the narrow seas, Germany had singled out and insisted on holding herself with a view to weakening England as a whole, and maintaining the securing of her own communications through the Straits of Dover. Let us suppose further, that after all this had happened, Germany was engaged in a great war in which she could show that she was on the side of freedom of a number of small nations, would Mr. Churchill as an Englishman who believed that his own nation had as good a right to freedom as any other, not freedom for a part merely, but freedom for the whole-would he, whilst Germany still maintained the partition of his country and occupied six counties of it, would he lead this partitioned England to join with Germany in a crusade? I do not think Mr. Churchill would. Would he think the people of partitioned England an object of shame if they stood neutral in such circumstances? I do not think Mr. Churchill would. They agreed to our use of Lough Foyle for naval and air purposes. The ownership of the Lough is disputed, but the Southern Irish authorities are tacitly not pressing their claim in present conditions and are also ignoring any flying by our aircraft over the Donegal shore of the Lough, which is necessary in certain wind conditions to enable flying boats to take off the Lough. They have agreed to use by our aircraft based on Lough Erne of a corridor over Southern Irish territory and territorial waters for the purpose of flying out to the Atlantic. They have arranged for the immediate transmission to the United Kingdom Representative's Office in Dublin of reports of submarine activity received from their coast watching service. They arranged for the extinction of trade and business lighting in coastal towns where such lighting was alleged to afford a useful landmark for German aircraft. They have continued to supply us with meteorological reports. 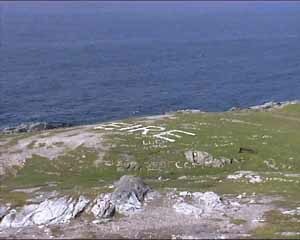 They have agreed to the use by our ships and aircraft of two wireless direction-finding stations at Malin Head. They have supplied particulars of German crashed aircraft and personnel crashed or washed ashore or arrested on land. They arranged for staff talks on the question of co-operation against a possible German invasion of Southern Ireland, and close contact has since been maintained between the respective military authorities. They continue to intern all German fighting personnel reaching Southern Ireland. On the other hand, though after protracted negotiations, Allied service personnel are now allowed to depart freely and full assistance is given in recovering damaged aircraft. Recently, in connection with the establishment of prisoner of war camps in Northern Ireland, they have agreed to return or at least intern any German prisoners who may escape from Northern Ireland across the border to Southern Ireland. They have throughout offered no objection to the departure from Southern Ireland of persons wishing to serve in the United Kingdom Forces nor to the journey on leave of such persons to and from Southern Ireland (in plain clothes). They have continued to exchange information with our security authorities regarding all aliens (including Germans) in Southern Ireland. They have (within the last few days) agreed to our establishing a Radar station in Southern Ireland for use against the latest form of submarine activity. The neutrality policy led to a considerable delay in Ireland's membership of the United Nations (UN). Ireland's applications for membership were vetoed by the Soviet Union, a permanent member of the Security Council, from 1946 to December 1955. The original use of the term "United Nations" in 1942–45 always referred to the Allies of World War II. Ireland had applied to join the UN in 1946, following the demise of the League of Nations, where Irish diplomat Seán Lester was the last Secretary-General. By March 1955, the Minister for External Affairs, Liam Cosgrave, announced that: “Ireland's application for membership of the U.N.O. still stands although it remains blocked by an objection in the Security Council.” For reasons of diplomacy the government would not state the reason for the objection, nor which country had made it. Sean MacBride considered that the UN boycott of Ireland was originally agreed at the 1945 Yalta Conference by Churchill and Stalin. Ireland's acceptance into the UN was announced by John A. Costello on 15 December 1955. ^ Mansergh, Nicholas (1968). Survey of British Commonwealth affairs: problems of wartime co-operation and post-war change 1939–1952. Routledge. p. 59. ISBN 978-0-7146-1496-0. ^ Constitution of Ireland, Article 13.4 – "The supreme command of the Defence Forces is hereby vested in the President." ^ "Pardon for WWII Allies deserters — The Irish Times — Tue, Jun 12, 2012". The Irish Times. 12 June 2012. Retrieved 23 January 2013. ^ Cole G. and Hawkins B; The world was my lobster, John Blake Publishing (2013) chapter 2. ^ Horgan, John (21 February 1998). "An Irishman's Diary". The Irish Times. Retrieved 20 February 2019. ^ Tracy, Robert (1999). "The Jews of Ireland". bNet.com. p. 7. Retrieved 30 November 2014. ^ Gilligan, H.A. (1988). A History of the Port of Dublin. Dublin: Gill and Macmillan. p. 166. ISBN 0-7171-1578-X. ^ Spong, page 11. "in the period April 1941 and June 1942 only seven such ships visited the country"
^ Burne, Lester H (2003). Richard Dean Burns (ed.). Chronological History of U.S. Foreign Relations: 1932–1988. 2. Routledge. p. 537. ISBN 978-0-415-93916-4. ^ Fisk, page 273, "Up to four huge tricolours were painted on the sides of each ship together with the word EIRE in letters twenty feet high"
^ Gleichauf, Justin (2002). Unsung Sailors. Bluejacket Books. p. 115. ISBN 978-1-55750-420-3. ^ Sinclair, Andrew (2001). Blood & Kin: an empire saga. Sinclair-Stevenson. p. 561. ISBN 978-0-9540476-3-4. ... or we're sitting ducks. So we sail past all these drowning sailors, and they call up to us, and we must sail on. I remember one crying, 'Taxi! Taxi!'. We didn't stop. ^ Sweeney, Pat (2010). Liffey Ships. Mercier. p. 227. ISBN 978-1-85635-685-5. ^ "War on U-Boats". Life Magazine. Time-Life: Cover and p. 79. 16 October 1939. ^ "Speech by Éamon de Valera at the League of Nations Assembly". Documents on Irish Foreign Policy. Royal Irish Academy. 2 July 1936. pp. No. 347 NAI DFA 26/94. Retrieved 27 March 2011. ^ Dáil Debates, 22 March 1939. ^ "Memorandum by Mr R. G. Menzies, Prime Minister". Department of Foreign Affairs and Trade (Australia). 10 April 1941. p. 1. Retrieved 27 December 2008. ^ "Churchill had Plan to Invade 'Nazi' Ireland". Winstonchurchill.org. 21 March 2010. Archived from the original on 19 March 2012. Retrieved 1 January 2012. ^ "Winston Churchill & Éamon de Valera: A Thirty Year "Relationship"". Winstonchurchill.org. Archived from the original on 3 July 2010. Retrieved 1 January 2012. ^ Kennedy, Michael (2008). Guarding Neutral Ireland. Dublin: Four Courts Press. p. 148. ISBN 978-1-84682-097-7. ^ Bew, Paul (2007). Ireland: The Politics of Enmity 1789–2006. Oxford: Oxford University Press. p. 468. ISBN 978-0-19-820555-5. Then he added:"Please don't mention that to anybody. It might get around"
^ "Hyde (and de Valera) offered condolences on Hitler's death". Irish Independent. 31 December 2005. Retrieved 26 April 2012. ^ Dermot Keogh (1989). "Éamon de Valera and Hitler" (PDF). Irish Studies in International Affairs, Vol. 3, No 1, p. 84. ^ "The Irish Nationalist And The Nazi: When Éamon de Valera Paid His Respects To Adolf Hitler". International Business Times. 10 September 2013. Retrieved 28 June 2015. ^ "Horrid History: troubled past Irish-Jewish relations". Irish Independent. 3 August 2014. ^ "Lester, Sean, 1929– (Sub-Fonds)". UNOG Library. Retrieved 6 November 2010. ^ Oireachtas (29 March 1955). "Dáil Éireann debate - Tuesday, 29 March 1955". Debates. Houses of the Oireachtas. Retrieved 28 September 2018. This seems unlikely, given that Yalta was held a year before Ireland's application to join the UN, and was based on press speculation. ^ Oireachtas (15 December 1955). "Dáil Éireann debate - Thursday, 15 Dec 1955". Debates. Houses of the Oireachtas. Retrieved 28 September 2018. This page was last edited on 20 February 2019, at 16:34 (UTC).